Tinker and Ernie, after an almost 12 mile hike. This hike finished their last leg for a 'WPD' excursion title either from AMCA or from HELP League. Ernie and Tinker - to the right - relax after a 20-mile hike in Interior forest at Frontenac Provincial Park 2011. Ernie carried 30 pounds, Tinker carried 28 pounds in their dog back packs :) This was the first excursion for their 'WPD' titles. Ernie has done many, many 'pack walks' and three or four over night hikes for HELP League's WPD certificates. I never bothered to keep track of them, though. So, at almost 10, he went out with Tinker to 'show her the ropes'. Good boy, Ernie! Tinker, bothering Ernie, in spite of being walked many miles, carrying a heavy load. This was her first 'pack walk.' While she'd had the pack on a few times for a few miles, it was never loaded with all the weight or for so many miles. Ernie, now going on 10 years of age, still has it in him to do any job he's asked to do, including an overnight camp out with 22 miles of walking and 30 pounds on his dog back pack. Although all of my Alaskan Malamutes have done some form of 'pack walking' I have very, very few pictures. Only Ooky has completed her requirements for a 'Alaskan Malamute working pack dog title' (non-competitive) but I'm going to finish a few other dogs before I send in for the certificates. 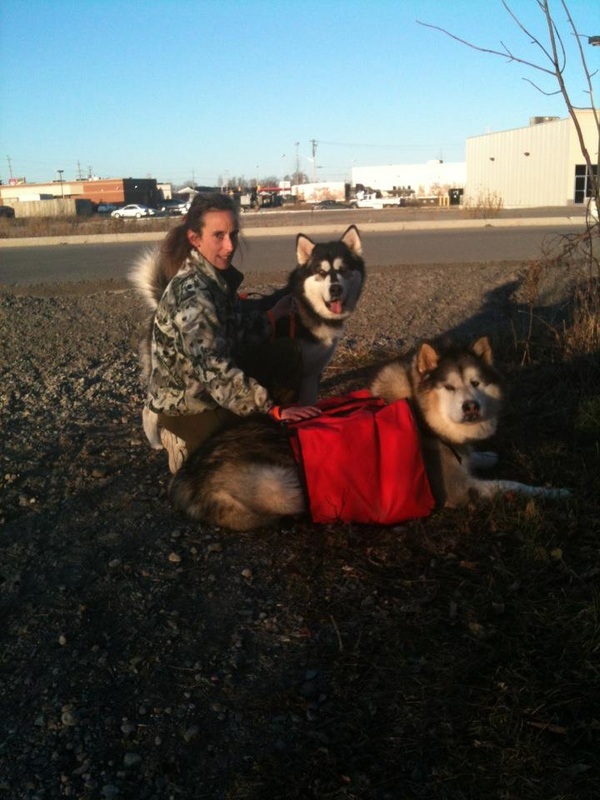 For the most part, all my time and energy goes toward the weightpull, scooter and sled competitions and I haven't really had the time the last few years to do much for the excursion trips (non-competitive) required Alaskan Malamute Club of America Working Pack Dog (WPD) title next. Cuddlymute: Ms Ook, in between tromps throguh the swamp, forrest and fields. 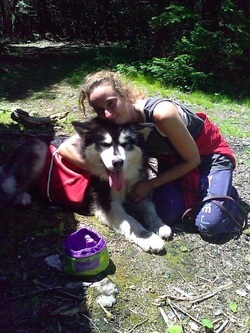 Back packing with an Alaskan Malamute can be fun! Ooky, the Alaskan Malamute, has been on many packing excursions. Prior to Bert being injured there wasn't a job Bert wouldn't take on - as long as it didn't involve 'noisy sound' since Bert was HORRIBLY sound sensitive. He is around two years of age in this picture. Bert all packed up and ready to go for an excursion!